British Prime Minister Theresa May faces a tough round of negotiations as she works to get more time. BRUSSELS — Tough-guy France softened its stance Tuesday and showed willingness to accept yet another delay in the long-awaited Brexit, diminishing the chances that Britain would crash out of the European Union this week without any future plan. But British Prime Minister Theresa May still has a rough day ahead of her as she heads to an emergency summit in Brussels on Wednesday to plead for a new extension – for the second time in three weeks. Such gatherings aren’t getting any friendlier. With nearly everyone fully resigned to Britain’s departure from the European Union, two questions took center stage Tuesday: How – and when – to get the U.K. out the door. EU countries, especially France, have become increasingly exasperated with the political division and uncertainty. The bloc’s leaders have tried to help May over the past two years of negotiations, even after she missed her chosen departure date on March 29 because of a parliamentary revolt. 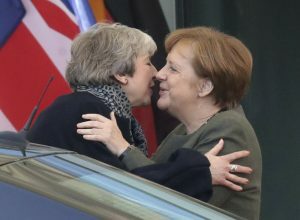 After obtaining a delay until Friday, she will be asking for another postponement that lasts until June 30 at the special EU summit. While Macron still has a long list of conditions, it was a notable shift in France’s tone compared to last week. The reason for the change was unclear, though concerns have been growing about how badly a hard Brexit would hit the French economy. France was also encouraged by May’s outreach last week to Britain’s political opposition to find a compromise, and Macron may have been swayed in part by a meeting with the Irish prime minister. EU rules say that any extension to the Brexit deadline needs unanimity among the 27 other member states, and even if smaller member states would be hard-pressed to do it on their own, France has never shied away from being an EU leader – even at the expense of Britain. But some EU leaders worry that could have drawbacks —– especially after British Brexit-backers suggested they would try to make life difficult for the EU.